The Tuesday Teaser blog post on the "mystery" raptor set off quite a discussion about differentiating Sharp-shinned Hawks and Cooper's Hawks — two accipiter species that look very similar. As Cooper's Hawks become more and more plentiful in the Meadowlands and elsewhere, these diagnostic tips can be most useful. 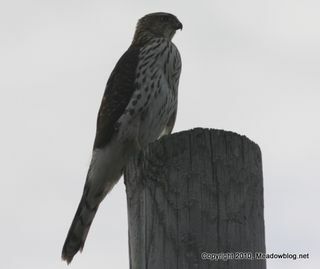 (one example — if the accipiter is perched on a post, as ours was, it is more likely to be a Cooper's. We came across a page on the Cornell Ornithotology Lab website that's helpful. 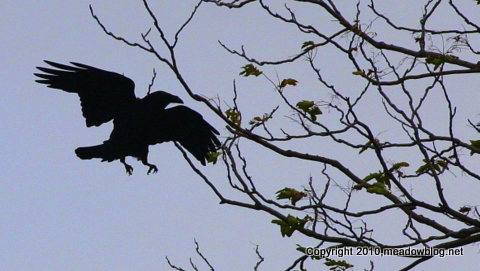 Some people say they see the adult Common Ravens at Laurel Hill year-round, but we haven't seen any in quite a while. Saw two on Monday afternoon near the nest. Great birds. It’s hard to believe, but October is flying by, with the shorebird migration all but over and many of the other migratory birds not far behind. The good news is that for a lot of waterfowl and raptors, our area is a major winter destination. A great place to see these amazing birds is the New Jersey Meadowlands Commission’s DeKorte Park – especially the park’s Transco Trail. The trail, which had been closed for a couple of weeks in September for repairs, is called the Transco Trail for good reason. The trail sits atop the Transco – short for “Transcontinental” – pipeline right-of way. The Transco pipeline runs 2,000 miles from South Texas to New York State, and provides 8.6 billion cubic feet of natural gas a day – or enough to meet the energy needs of 30 million people. Transco is the major artery for natural gas for the entire eastern United States. It was originally built in 1950 and according to a spokesman for The Williams Companies, which operate the pipeline, it is the largest pipeline by volume in the United States. 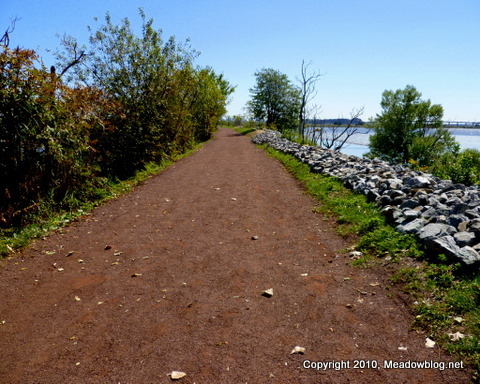 The Transco Trail runs 1.2 miles from the AMVETS Carillon in North Arlington to the western spur of the New Jersey Turnpike, and it provides recreation for thousands of park visitors a year. To get to the Transco Trail, park in the lot nearest the administration building, head south, and turn left or right on the first wide trail you encounter. Head east (to your left) and you can walk seven-tenths of a mile to western spur of the New Jersey Turnpike. Al;ong this stretch you should be able to see the Canvasbacks, plus some Ruddies and Pintails. If you head west from the parking lot on the Transco Trail, you can walk a half-mile to the 40-foot-tall AMVETS Carillon, which chimes every 15 minutes. The Carillon area itself was a prime viewing spot last winter for a rare Northern Shrike, which attracted hundreds of birders during its three month stay, from mid-December to mid-March. Along the way you should be able to see Green-winged Teal in late fall and winter, and the sky above sometimes affords nice looks at Northern Harriers and other winter raptors. But don’t take our word for it. Come to DeKorte Park and see for yourself. NJMC Communications Officer Jim Wright maintains the Commission’s daily nature blog, meadowblog.net – featuring beautiful photography and the latest info on the region’s abundant natural wonders.